In a rare visual feast of luscious images and deliciously descriptive text Li Edelkoort, one of the world’s most revered trend forecasters, has highlighted the inspirational link between food and kitchen materials. Edelkoort states that food and materials inspire each other, with food graduating as a new design discipline to be reckoned with. In this large format book, Form Follows Food a material forecast, Edelkoort explores three breaking trend directions in colour and finishes, expertly illustrating the link between some of our favourite foods and the colours and materials that will be adorning our kitchens. Form Follows Food also shines a light on three contemporary designers whose work is connected to food, in both an inspirational and visually enticing way. 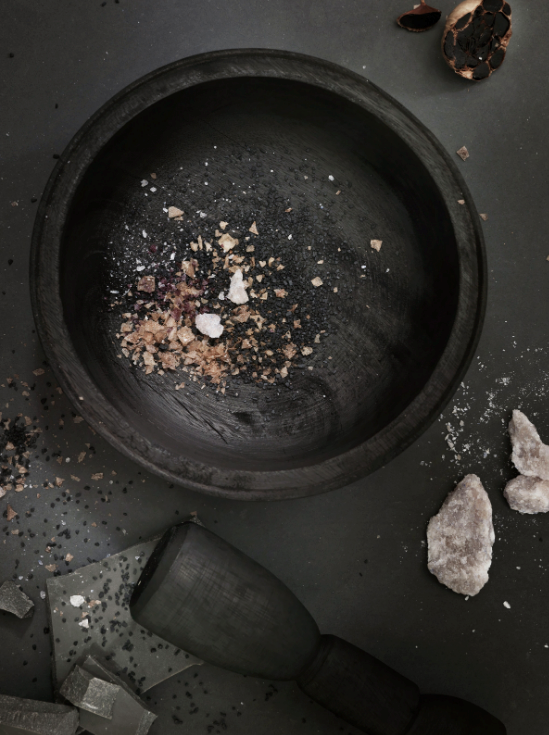 The book’s striking images, in which heirloom vegetables and rustic foods sit within a miniature landscape of Caesarstone quartz surfaces and artisanal handmade vessels and platters, are a sublime mix of inspired textures and emotive colour palettes. 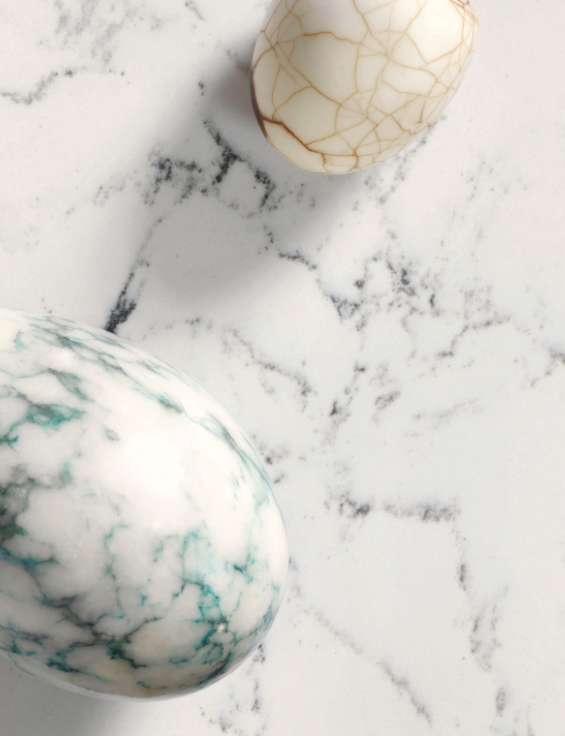 The natural beauty and organic patinas of the Caesarstone finishes highlight the undeniable link between the beauty and fragility of nature’s food and the strength and sophistication of its building materials. Edelkoort cites the kitchen as the best place in the house – a place where the link between the latest finishes and materials and the most delicious foods and raw ingredients can be seen on a daily basis. 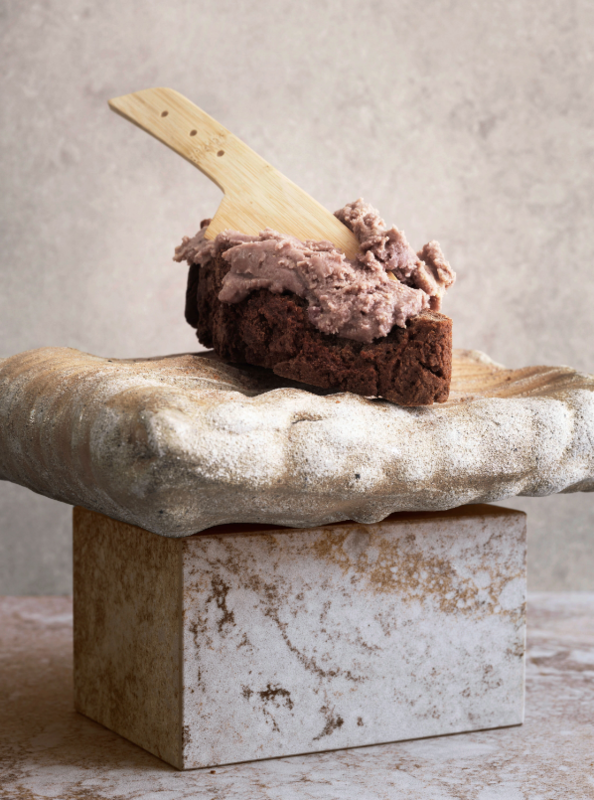 Through Edelkoort’s eyes food is seen as a reflection of its surroundings – pastes reference concrete while marble veining emulates cheeses, meringues and even fruits. The images bring some of the newest trends in kitchen design into sharp focus – for example the image representing the dramatic move from antiseptic white to black quartz in the kitchen. 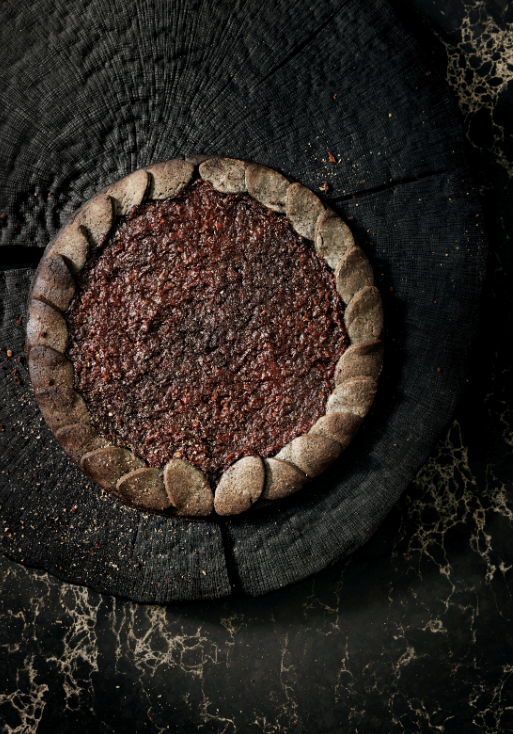 A rustic black Linzer torte, filled with vegetable carbon paste and a marmalade of black Krim tomato and bramble, is set against the darkly dramatic, richly veined Vanilla Noir quartz surface from Caesarstone. 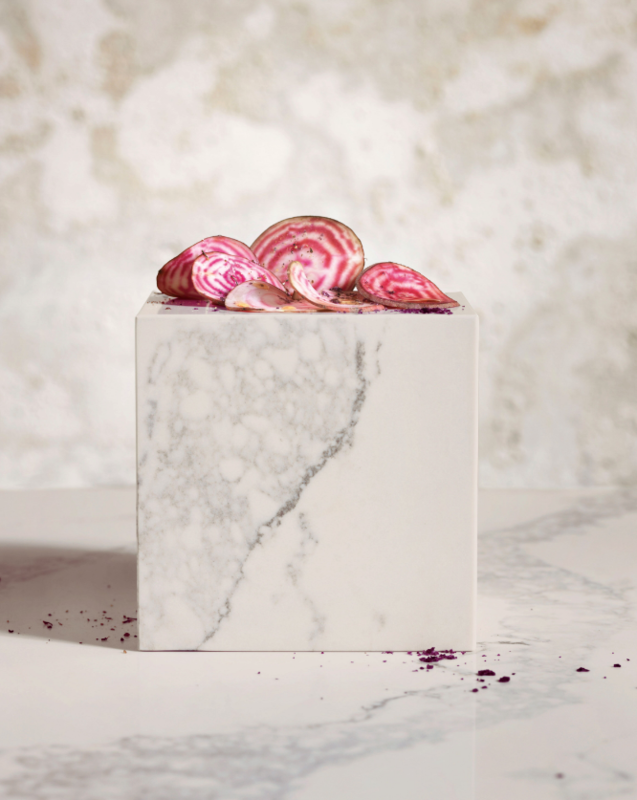 In another image, the sublime elegance of beetroot carpaccio is placed on a pedestal of delicate veining and organic patina courtesy of Caesarstone’s Statuario Maximus. Edelkoort’s informative and beautifully descriptive text reveals a smorgasbord of beauty in the form of inspirational finishes, artisanal foods and evocative crafts. And in further good news, Form Follows Food a material forecast is available to all via download. Or visit one of Caesarstone’s many showrooms and have a look at this deliciously inspirational tome in the ‘flesh’. Posted in Architecture & Design, Talking Business. Bookmark the permalink.